Our latest results arising from a collaborative work with experimental groups in École Polytechnique Fédérale de Lausanne (EPFL), Neuchâtel, University of California Berkeley, National Institute of Advanced Industrial Science and Technology (AIST Japan) and the Institute for Nanotechnology, University of Twente, is published now in Journal of Physical Chemistry C (link). In this work we studied transparent conductive oxides (TCOs), which are essential in technologies coupling light and electricity. For Sn-based TCOs, oxygen deficiencies and under-coordinated Sn atoms result in an extended density of states below the conduction band edge. While shallow states provide free carriers necessary for electrical conductivity, deeper states inside the bandgap are detrimental to transparency. In zinc tin oxide (ZTO), the overall optoelectronic properties can be improved by defect passivation via annealing at high temperatures. Yet, the high thermal budget associated with such treatment is incompatible with many applications. In our most recent work, we demonstrate an alternative, low-temperature passivation method, which relies on co-sputtering Sn-based TCOs with silicon dioxide (SiO2). 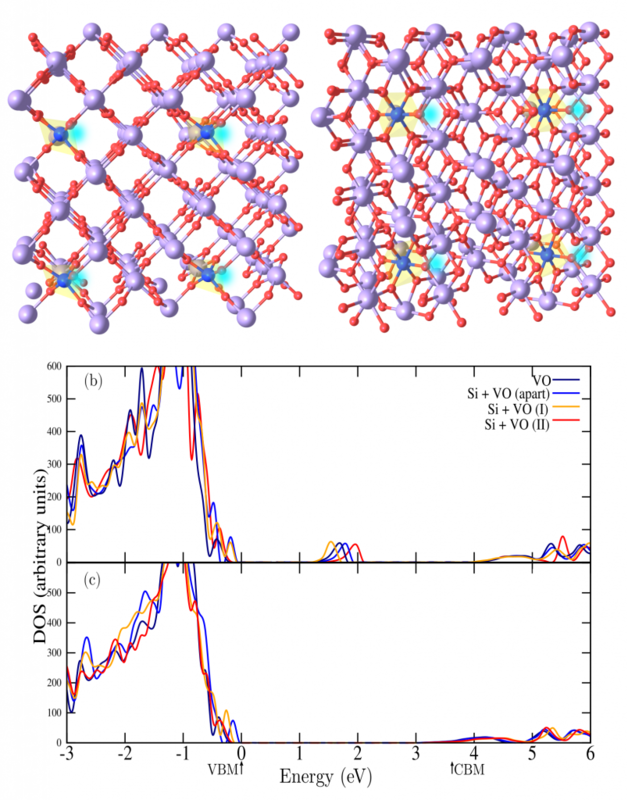 Using amorphous ZTO and amorphous/polycrystalline tin dioxide (SnO2) as representative cases, we demonstrate through optoelectronic characterization and density functional theory simulations that the SiO2 contribution is two-fold. First, oxygen from SiO2 passivates the oxygen deficiencies that form deep defects in SnO2 and ZTO. Secondly, the ionization energy of the remaining deep defect centers is lowered by the presence of silicon atoms. Remarkably, we find that these ionized states do not contribute to subgap absorptance. This simple passivation scheme significantly improves the optical properties without affecting the electrical conductivity, hence overcoming the known transparency-conductivity trade-off in Sn-based TCOs.